BERLIN -- Porsche SE raised 4.9 billion euros ($7.1 billion) in a rights offering, boosting the sports-car maker's chances of completing a merger with Volkswagen AG. A total of 99.7 percent of the available preferred shares were bought in the rights offering, with the remainder sold on the open market, Porsche said Thursday. The Porsche and Piech families, who control the common stock, also participated. Porsche will use the proceeds to cut debt to 1.5 billion euros, a prerequisite for the merger with VW. The sports-car maker and Volkswagen agreed to combine in 2009 after Porsche racked up more than 10 billion euros of debt in an unsuccessful attempt to gain control of VW. The company's debt rose to 6.34 billion euros by Dec. 31 from 6.05 billion euros on July 31. "This is a very vital step on the way toward a merger with VW," said Juergen Pieper, a Bankhaus Metzler analyst in Frankfurt. "Porsche's debt has been a most pressing issue for VW; completion of the stock sale was absolutely indispensable to remove that stumbling block." Porsche preferred shares gained as much as 91 cents, or 2 percent, to 45.47 euros, and were up 0.3 percent to 44.69 euros as of 11:50 a.m. in Frankfurt trading. The stock has declined 12 percent this year, valuing the carmaker at 13.7 billion euros. Porsche issued 131.25 million new shares, evenly split between preferred and common stock. "With the successful capital increase, and as a result the significant decrease in Porsche's debt, we're taking an important step toward an integrated automobile company,' Martin Winterkorn, who runs both carmakers, said in a statement. The shares were sold at 38 euros apiece, with one existing share carrying the right to subscribe to 0.75 new shares. VW's merger with Porsche, originally scheduled for completion in the second half, will probably be delayed into next year because of German legal obstacles. An investigation into share-price manipulation allegations will likely push the deal's completion into 2012, Porsche said Feb. 24. 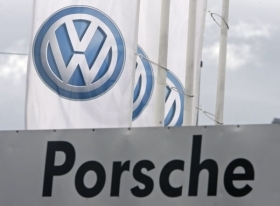 VW now owns 49.9 percent of Porsche's carmaking operation. The Porsche and Piech families were expected to spend 2.25 billion euros on the share sale, while Qatar Holding, part of the country's sovereign wealth fund which owns 10 percent of Porsche's voting stock, planned to contribute 250 million euros, Chief Financial Officer Hans Dieter Poetsch said last month.